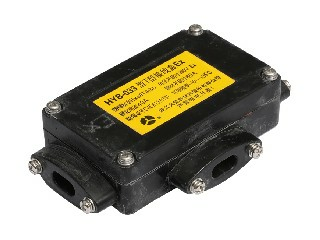 The explosion-proof intermediate junction box includes an explosion-proof straight junction box (commonly known as two-way) and an explosion-proof T-type junction box (commonly known as tee). It is mainly used in the connection between the electric heating belt and the electric heating belt in the explosion-proof area to increase the length of the electric heating belt, or to use different powers such as electric heating belt and trigeminal tube on the same pipeline. The outer casing is made of DMC plastic. (1) If the casing of the installation junction box is found to be deformed, cracked or damaged, it should be stopped and replaced with new ones. (2) Prevent short-circuit between the core wire and the heating wire and the outer braided copper wire during installation. And to ensure that there is enough clearance. (3) Use the blocking plate to block the unused inlet holes.